Note these may change at any time before the patch goes live. I’m only posting these for interest sake. After plugging into Miss Medicina’s brain we believe that the base mana pool for a priest at 85 is 7540. This is based on the mana cost of spells, which are of course based on a percent of base mana these days. Using Dawn’s screenshot below as a source we can see she has 23295 mana pool while naked and without talents. She has 199 intellect. Dawn Moore came to the party for this one. She provided me with a screen shot of herself naked showing her spirit based mana regen. If you look at the regen page linked above this number is in the right area, although i’m surprised, given previous expansions, that this number isn’t a little lower. Perhaps Blizzard decided to balance mana regen another way, like getting rid of most of our additional mana regen sources. This entry was posted on Tuesday, September 28th, 2010 at 11:26 am and is filed under Blogging. You can follow any responses to this entry through the RSS 2.0 feed. Both comments and pings are currently closed. 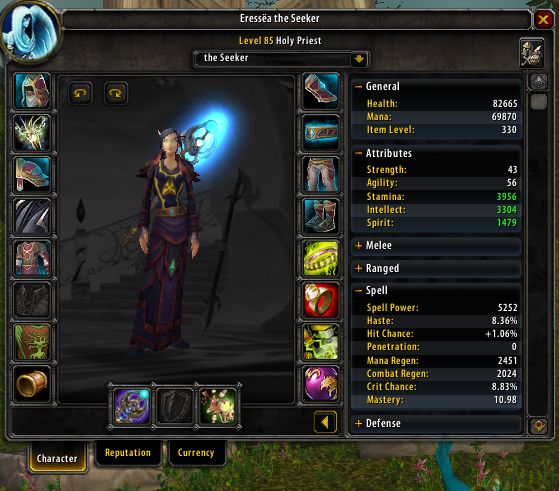 I play a priest on the beta on level 85. And I don’t think the base mana pool is 7540. If I’m naked I’ve got 23235 mana. A shild costs 3912 mana or 19% base mana. To proof this I take the formula for “mana from in”, I’ve got 195 Int. So I think the base mana on level 85 is 20590 or did I forgot something ? Darn. I saw Dawn’s mana pool in the image above and wondered about 7540 as a base mana pool. I’ll edit the article. In some recent number crunching I obtained some different results for the regen coefficient. [0.005489652, 0.005608993] which could be obtained from your screenie. 0.005575.. which is exactly what we have now at 80. In other words, I don’t think they changed the coefficient yet. What do you think? I’m sorry for not having double checked this earlier. I checked out your calculation when you posted it and accepted it as valid without checking it out with other numbers I had. Actually, working with 0.005575 obtains exactly the results from the character sheets in both the numbers I recieved and Dawn’s pic. Do you too think this could be right? You could be right. The screenie was for a level 85 from the beta though. As I said in the article the number was closer to the existing number than I expected. So you idea that it is unchanged has is quite likely correct. We will need more data points to get a more accurate number. I checks out with 0.005575 as base coefficient. With the 0.005575 baseregen it works out. With 0.00549 you would obtain 2.982 MP5 out of combat. Keep up the awesomeness Bob!